Paper presented at the seminar “Terrorism 2002: The Year in Review” at The International Policy Institute for Counter-Terrorism, Herzlyia, 20 January 2003. At first glance Hizballah, Iran and Syria seem to be a triangle coalition without any link to the fourth player, Iraq. Yet, in fact, much of their strategy during 2002 has been shaped by an “objective” alliance, to use a term dear to the Marxists-Leninists—an alliance they forged in face of the U.S. determination to wage a war against Iraq. Hizballah has been at the forefront of this strategy, as an independent player on its own, and as the champion of Syria and Iran’s strategic interests. Hizballah has emerged significantly strengthened on the Lebanese, regional and international arena as a result of the unilateral Israeli withdrawal from South Lebanon in May 2000. The Israeli withdrawal is perceived in the Palestinian, Arab and Islamic arenas as a great victory in the fight against Israel, the United States and the enemies of Islam. A graph of Hizballah’s 2000 activity, makes it is clear that the beginning of the Palestinian intifada in October 2000 was the trigger for the continuation of Hizballah’s armed struggle against Israel. This was illustrated by the abduction of three Israeli soldiers in the Har Dov sector and of another Israeli citizen abroad, through a terrorist-intelligence scheme. Hizballah sees its active involvement in the Palestinian intifadah as part of the inevitable fight against the imperialist threat represented by the United States. The organization attempts to insure the Palestinians a similar victory to that of the Islamic Resistance in South Lebanon. This strategy fits in with its original ideological vision that the Islamization of Lebanon is not possible in the framework of the balance of forces between the various religious communities, and the clear Syrian interest to keep its grip on the country. Therefore the final goal will be achieved, by necessity, through the liberation of all Palestine and the holy city of al-Quds, i.e. Jerusalem. During 2001, Hizballah supported the Palestinians through artillery shelling and ground attacks against Israeli positions in the Shaba’a Farms sector on Israel’s northern border, but, by the end of the year, was deterred by the new Israeli government’s decision to strike at Syrian targets in Lebanon in April and July. This deterrence was enhanced even more by the new international situation resulting form the September 11 attacks against the U.S. and the consequent campaign against al-Qaida and the Taliban in Afghanistan. However, after the quick American victory in Afghanistan and the evaluation that the U.S. would turn to deal with other rogue organizations and states of the “axis of evil”, the Hizballah leadership, in coordination with Syria and Iran, decided to increase its confrontation with Israel by actively supporting the Palestinian intifadah. This was meant to escalate the tension in the region in an attempt to obstruct further American action against Iraq. Subsequent events during 2002 help to bolster this conclusion: The involvement of senior Hizballah operatives in the Karin-A affair in January, and the attempt to smuggle katyusha rockets through Jordan at about the same time, in order to fuel the Israeli-Palestinian conflict. Then on 12 March 2002, Hizballah-backed Palestinian infiltrators attacked civilian vehicles in northern Israel, killing five civilians and one IDF soldier. This was two weeks before the deadly Hamas suicide bombing at the Park Hotel in Netanya on Pesah night and the consequent IDF Defensive Shield Operation. Hizballah’s attempt to destabilize the region peaked from 30 March through 13 April, when militants fired heavy mortars and katyushas against IDF positions in the North of Israel as. In order to keep the tension high at the border, and to show its constituency that there is no cease-fire from its part Hizballah used a new military tactic: between the major ground attacks, the organization directed anti-aircraft fire at IAF planes overflowing Lebanese air space. After four months of tense calm, on August 29, there was a new Hizballah attack on Israeli posts in the Shab’a Farms. This was probably a response to U.S.-Israeli pressure on Syria and Lebanon on the eve of the U.S. Congress discussion of the Syria Accountability Act. It appeared to be timed to coincide with the U.S. escalation against Iraq and the visit of Iraqi Vice President Taha Yasin Ramadan’s to Lebanon. All this activity developed under the umbrella of an estimated arsenal of some 9,000 rockets and missiles, including new 70-kilometer missiles that put the cities of Haifa and even Hadera within their range. In parallel with its open military activity, Hizballah has made a huge effort to achieve an independent terrorist/intelligence infrastructure inside the Palestinian Authority and Israel. Cells of Israeli Arabs recruited by the Hizballah for intelligence and terrorist missions were discovered in November 2000, June 2001, September 2001 and lately in July 2002. Are we witnessing a Syrianization of Hizballah? I have always been of the opinion that it is Syria, rather than Iran, that is most responsible for strengthening of Hizballah’s strategic weight and its freedom of action in Lebanon. Iranian financial, logistical and military support to the organization is dependent to a large degree on the good will of the Damascus regime. Since the death of Hafez al-Asad, his son Bashar has enjoyed what is termed a “special,” “strange”—some even say “hypnotic”—relationship with Nasrallah. This has changed the balance of power between the two sides, with a greater amount of independence and ascendancy for Hizballah’s charismatic leader. Even under U.S. pressure, Syria has refused to take any action against what it calls the “Resistance”—Hizballah and the radical Palestinian organizations—acting from its territory and has induced the Lebanese government to do the same. There are reports that since the middle of 2002, Syria has shipped 220mm rockets to Hizballah, with a range of 30 km, (and according to other sources, 70 km) probably in order to have more direct leverage over this aspect of Hizballah’s strategic arm. In January of this year, Israeli sources reported that the Syrian army held joint maneuvers with Hizballah, along with units of the Iranian Revolutionary Guards in Lebanon. Iran has continued to massively support Hizballah and to coordinate its activity against Israel. Besides the regular shipments of weapons, the military training of Hizballah fighters and the financial support to the Dawa (the socio-economic infrastructure) of the organization, it was lately reported that Iran has deployed Zelzal-2 rockets (610mm heavy artillery rocket with a 600 kg payload and range of 210 km) in Hizballah-controlled territory. According to U.S. intelligence officials Iran’s annual budget for Hizballah in 2002 exceeded $100 million. Iran also seeks to directly arm Palestinians in the West Bank and Gaza. Israeli forces seized two boats—the Calypso and the Santorini—involved in smuggling Iranian arms from Lebanon to Gaza prior to sizing of 50 tons of Iranian weaponry on the Gaza-bound Karine-A ship. Iranian attempts to conduct terror operations through Jordan have presented another danger to regional stability. Iran has sponsored at least 17 attempts to launch rockets and mortars from Jordan into Israel. Iran also continues to support the Kurdish PKK and radical Turkish Islamist elements acting against Turkey, although on a much minor scale than in the past. However, it should be noted that many Iranian reformists have declared themselves unwilling to be “more Palestinian than the Palestinians themselves” and some reformist papers have even criticized the suicide bombers. The existence of a two-track situation became even clearer after a surprise visit to Beirut in April 2002 by Khatami’s foreign minister, Kamal Kharazi, which appeared to be aimed largely at calming the situation. As though in response, the very next day Hizballah carried out a major attack on Israeli positions in the Shab’a farms. What strategy for the near future? Until recently, Israeli military intelligence and many analysts estimated that there is a real danger that Hizballah will open a “second front” against Israel from the North, in order to disrupt a U.S.-led war against Iraq, before or during the opening of the American military campaign. The Strategic Triangle. The pro-Syrian Lebanese daily al-Safir has described the development of relations in the “Syria-Iran-Hizballah triangle” as so close that “it is now difficult, indeed impossible, to separate the three parties or disengage the three tracks.” According to the journal’s sources, current and expected future developments will, “at the right time,” feed Hizballah’s regional role in cooperation with Syria and Iran. Hizballah will be ready to move on to its “regional dimension,” when the U.S. will enhance the current level of support for Israel and “directly join the Israelis in the confrontation against the Palestinians”. Israel’s targeting of the physical presence of the Palestinians in Palestine (the so called “transfer”) will be another potential moment. And any targeting of Syria or Iran will also be an appropriate “time” for Hizballah to assume its regional role. In recent days, top Hizballah officials indicated that the organization has no intention of attacking Israeli targets during an American offensive against Iraq. Nasrallah declared in an interview that the organization will not respond to Israeli “provocation” on the northern border but it will show no restraint should Israel attack Lebanon. Since autumn 2002, and more so since president Bush’s victory in the U.S. elections and the anti-Iraqi vote in the Security Council at the beginning of November 2002, the triangle alliance of Hizballah, the Alawite regime in Syria and Iran appears to have assumed that it is too dangerous to confront the U.S. at this stage. They apparently decided to wait for what seems the inevitable campaign against Iraq and to rely on a long-range regional strategy that would take advantage of the Shi’a predominance in Iraq in the post-Saddam era in order to revert the tide in their favor and deprive the U.S. of its success. According to Nasrallah’s deputy, Sheikh Na’im Qasim, if the American attack on Iraq works, pressure on Lebanon, Syria and Iran will mount. But the situation is complicated and “[e]xperience proved that many plans drawn up by the arrogant ones failed.” Therefore Hizballah must be ready for all developments and hope that it will prevail as it prevailed over Israel. Hizballah leaders see the Wazzani river crisis and the lack of an Israeli reaction, due to American pressure, as a strategic victory that gives them the necessary respite to wait and see how things evolve on the Iraqi front. The supply of long-range missiles to Hizballah also enforced the deterrent leverage the organization has on Israel, as Israel is limited in its response by the constraints imposed on it by U.S. interests in the region. Much depends, in my opinion, on how decisive and swift the outcome of the military campaign against Iraq will be, how complete the destruction of the Iraqi regime, and how the Iraqi masses react to the new situation. A last word about the possible cooperation between Hizballah and al-Qa’ida: Much was published at the beginning of 2002 about contacts between al-Qaida operatives in Lebanon and Hizballah. Although Hizballah has denied these low-level contacts, we know the reliability of such denials. Iran, for instance, expelled 16 al-Qaida members to Saudi Arabia after denying their presence on its soil. But in my opinion, the danger of such cooperation will increase only after the war in Iraq, when the two parties will feel directly threatened by a Bush administration eager to continue the war against terror on the crest of a successful campaign in Iraq. 1. The ALF has the specific mission of encouraging suicide operations by providing financial support to the families of Palestinian suicide terrorist (in the form of $25,000 per family). 2. The ALF has twice tried over the past 18 months to organize attacks against civilian aircraft at the Ben-Gurion International Airport. 3. The secretary-general of the Palestine Liberation Front (PLF), Abu al-Abbas (Mahmoud Abbas), has been granted asylum in Baghdad, members of his organization are trained in Iraqi camps and have carried out terrorist attacks in Haifa (April 2001) and the West Bank (July 2001). More recently, there is the fear that Iraq will use these organizations to wage biological or chemical attacks in Israel when the U.S. attacks Iraq. In my opinion, even if the Saddam regime finds the necessary terrorists to organize such an attack, due to the operational and technological difficulties the chances of success are quite low, and carry a great risk of doing more harm to the Palestinian population than to the Israelis. 1. The first cell of collaborators came to light in November 2000 with the arrests of seven residents of Abu Snan, a village in the Western Galilee, on charges of spying for Hizballah and plotting to abduct Israeli soldiers on its behalf. In June 2001, three Israeli Arabs from Yafi’a and Kfar Kanna were indicted for plotting to steal weapons from an Israel Defense Force (IDF) base and send information to Hezbollah. In September 2001, Israeli security forces arrested four Druze Israelis in Rama and Daliat al-Carmel on charges of smuggling weapons into Israel from Lebanon.The Israeli security services recently arrested an Israeli citizen, Nissim Nasser, a Lebanese Jew who was charged of spying for Hizballah, providing photand maps of targets for “mega-terrorist” attacks. In July 2002, Israeli officials announced that they had uncovered a Hizballah plot to kidnap Israelis abroad, an operation devised by an Israeli Arab from who moved to Lebanon in 2000 and became a Hizballah operative. Also in July, four Arab Israelis who smuggled weapons and transmitted intelligence to Hizballah in return for drugs were arrested. 2. Interview to MBC, 12 July 2002. 3. Fadlallah, “Our Stand,” July 30, 2002, at Fadlallah’s website, www.bayynat.org. 4. “Iran/Jihad and Terrorism,” MEMRI Special Dispatch - June 11, 2002, No. 387. 5. 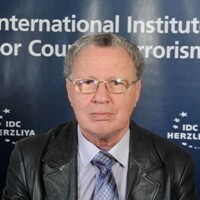 Jim Muir, “Iran - Focus on Palestine,” Middle East International, 19 Apr. 2002, p. 22. 7. Tehran Nowruz, 9 May 2002. 8. Beirut al-Safir, 29 October 2002.